This 2014 issue from Argentina depicts the Throat of the Devil — an abyss in Iguazu Falls. A walkway allows visitors to go to the edge of an overlook. Parque Nacional Iguazu in Argentina welcomes thousands of visitors daily. The 2014 four-stamp Argentina souvenir sheet for the Iguazu Falls includes images of native flora and fauna, including four species of butterflies. Stamps depicting South America’s Iguazu/Iguacu Falls have been issued by a number of different postal entities, from Argentina to the United Nations. This 2007 U.N. stamp is part of a continuing World Heritage series. For the 1972 Year of Tourism in the Americas, an Argentina 45-centavo stamp depicts one of the country’s top attractions: Iguazu Falls in the tropical rain forest. Two stamps of the same design, showing Iguacu Falls, were issued in 1938 by Brazil. Argentina’s Iguazu National Park was created in 1934, and represented on this stamp in 1936. The 1908 postcard mailed from Buenos Aires arrived in Paris less than a month later. A 1908 picture postcard portraying Iguazu Falls was mailed from Buenos Aires to France by a tourist. In contrast with the 1908 postcard, this Iguazu Falls postcard mailed by the author in March 2016 took more than three months to reach its destination in New York City. Imagine a land of lush tropical forest, where the background sound is rushing water, there are constant rainbows in the mists, and hordes of butterflies land on you if you keep still. This is not a fantasy, but a real place, one of the greatest waterfalls in the world. Iguazu (in Spanish) or Iguacu (in Portuguese) Falls is on the boarder of Argentina and Brazil and protected by national parks in both countries. The cataracts are elaborate — almost 300 separate waterfalls, dropping an average of 220 feet over a front of 1.7 miles. The complexity of this landmark creates great challenges for stamp designers: How to represent this huge and amazing place? Argentina’s protected area, Iguazu National Park, was created in October 1934. A 5-peso vertical-format stamp was issued in 1936 (Scott 448), depicting palm trees in the foreground and two tiers of delicately engraved waterfalls in the distance. Iguacu National Park was Brazil’s first such park, created in 1939. By that time, Brazil had its own stamps honoring the falls: a 1,000 reis denomination and a 5,000r, both with the same design, inscribed “Cataratas de Iguassu” (Scott 455-456). The 1,000r stamp is shown nearby. This handsome design features rocks in the foreground, with a tiny seated figure at the base of the falls. A series of torrents plunges from cliffs above, appearing closest at the left and receding into the middle of the stamp. The design provides a suggestion of the power of the waterfalls, despite representing only a small part of the entirety. With increasing mass tourism and easy jet travel later in the 20th century, Brazil, and especially Argentina, began to publicize this greatest of South American waterfalls on stamps. In 1972, Argentina issued a 45-centavo stamp for the Year of Tourism in the Americas (Scott 985). With a tropical forest framing the right side of the stamp, the viewer is treated to the sight of two tiers of waterfalls, with the lines of falls hinting at the underlying geology — layers of ancient lava flows that form the plateau from which the water tumbles. The national-park infrastructure on both sides of the Iguazu River is sophisticated and well-designed. A free railroad brings visitors part of the way into the Argentine park. The trails can handle the thousands of visitors daily, protecting the jungle while keeping the tourists safe. A park ticket is shown nearby. Metal walkways cut through the forest, leading to the base level of the falls via one trail, and right along the edge of the cliffs where water spills over the abyss along another route. Most spectacular amid this symphony of waterfalls is a central chasm that takes almost half the river’s flow. The Garganta del Diablo, the Devil’s Throat, is an abyss where torrents thunder downward. Remarkably, a sturdy walkway has been engineered right to the brink of the falls. You can look straight down from this vantage point — the roar is immense, the plunge is hypnotic, and the spray can be drenching. 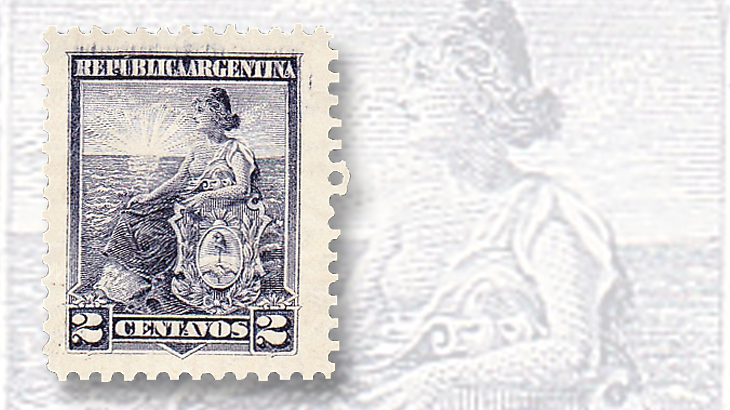 A recent Argentina stamp, from 2014, makes the attempt to depict the Devil’s Throat (Scott 2725c). The stamp is shown here on a first-day cover. While the overview clearly illustrates the topography of the falls, the designer has added a toucan in profile, which somewhat reduces the impact of the falls’ image. The Devil’s Throat stamp is part of a souvenir sheet which, taken as a whole, has by far the best depiction of Iguazu Falls. This complex issue by Correo Argentino, Argentina’s postal administration, includes four stamps: 10-peso Devil’s Throat Falls, 8p Butterfly (Doxocopa linda mileta), 10p San Martin Falls, and 8p Exotic Flower (Fuschia bromeliad billbergia zebrina). The selvage of the sheet has a wonderful aerial view that includes much of the 1.7-mile fall line, from Brazil at left to Argentina at right, and segues into the San Martin Falls stamp. This stamp shows the falls in the correct location but from a lower, more revealing angle. Three other major falls in the Iguazu group are named on the souvenir sheet: Salto Mbigua, Salto Bernabe Mendez, and Salto Bossetti (rather alarmingly, “salto” means “jump”). The souvenir sheet also maps the scenic railway and the three hiking trails in the Argentine park. In all, four species of butterflies also are depicted: one on an 8p stamp and three in the selvage: Diaethria clymena, also known as “Cramer’s Eighty-Eight” because of its wing markings; Anartia amathea, the brown or scarlet peacock; and an iridescent blue Dynamine tithia. Lastly, the one mammal shown is the coati (Nasua nasua). This critter might be considered the “serpent in paradise” of the Iguazu Park. A relative of the raccoon, the coati has become completely habituated to the tourist throngs. Packs of them wait near park snack bars, and they are well-prepared to hijack your food in a moment’s inattention, as I found out the hard way. Iguazu National Park (Argentina) was declared a UNESCO World Heritage Site in 1984, and Iguacu National Park (Brazil) followed in 1986. Both parks are well-engineered to provide amazing vistas of the many waterfalls while simultaneously protecting the rare Atlantic Rain Forest ecosystems. Robust steel walkways provide easy access to all the sights. Visitors may not stray from these pathways, and wilderness begins at the railings. Argentina’s attractive Seated Liberty issue offers full collecting range: There are a multitude of reasons why Argentina’s Seated Liberty stamps of 1899-1903 offer an inviting field for specialization. It is a remarkable situation that Iguazu National Park can host a million human visitors annually while much of the surrounding forest is able to remain intact. This wonderful refuge hosts diverse species. Birds living there include the heron, ibis, vulture, hawk, kite, eagle, dove, parrot, parakeet, cuckoo, screech and pygmy owl, swift, at least eight species of hummingbird, toucan, woodpecker, creeper, flicker, flycatcher, kingfisher, jay, thrush, warbler, tanager, finch, cowbird, and many others. Mammals include the jaguar, puma, ocelot, howler and capuchin monkey, tapir, peccary, anteater, armadillo, fox, otter, raccoon, coati, capybara, agouti, opossum, and a great variety of bats. Butterflies abound, as well as numerous types of insect, snake, lizard, caiman, turtle, frog, and fish. Iguazu Falls is a must-visit locale for many tourists to South America, despite being well off the track of other popular destinations. Although mass tourism is a mid-20th-century phenomenon, I located a beautiful picture postcard, which is shown here, of Salto Iguazu from 1908 indicating the area was a tourist destination even then. The card bears a jaunty greeting in French on the picture side. The front of the card is dated “8-10-08” and posted in Buenos Aires, it was backstamped “Nov 3” in Paris. Assuming the sender’s handwritten date was in standard European order, making it Oct. 8, the card had an amazing transit time of less than a month from Argentina to France. During my visit, I mailed postcards from both Brazil and Argentina, and they took more than three months to reach New York City. Today, a modern airport on the Brazilian side is the main gateway to the falls, receiving many flights daily. If you cannot come in person, there are several movies that incorporate the falls: in 2008, Indiana Jones and the Kingdom of the Crystal Skull; the 1979 James Bond film Moonraker; and, most notably, The Mission, a 1986 epic about the native peoples, slave-traders, and missionaries, starring Robert De Niro and Jeremy Irons. And, of course, you can visit via your stamp collection. A good-looking topical stamp collection of Iguazu Falls can be assembled at little cost, with issuing countries including Argentina, Brazil, the United Nations, and others. Here's a handy table listing Iguazu Falls stamps, to help you get started.